Course Website: Official Website - Visit Conestoga Golf Club's official website by clicking on the link provided. 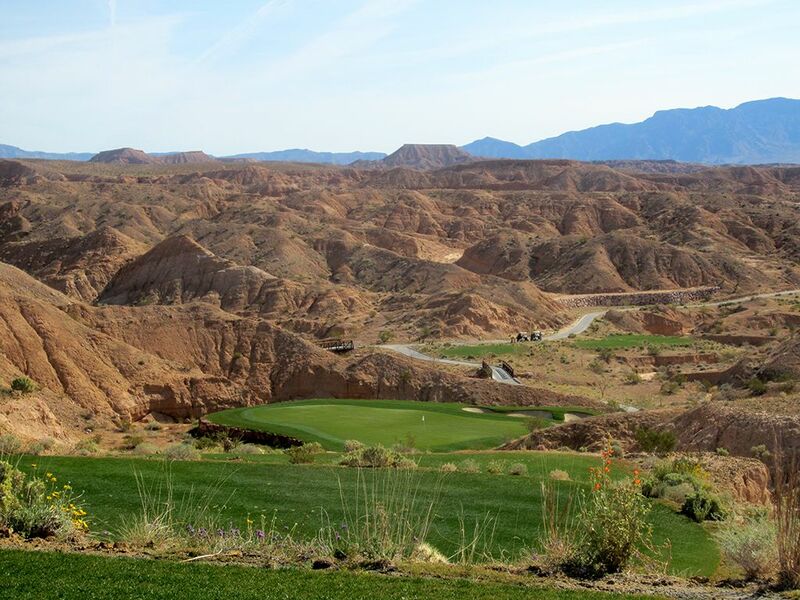 Accolades: Ranked 13th in Nevada on Golf Course Gurus' Best in State list. 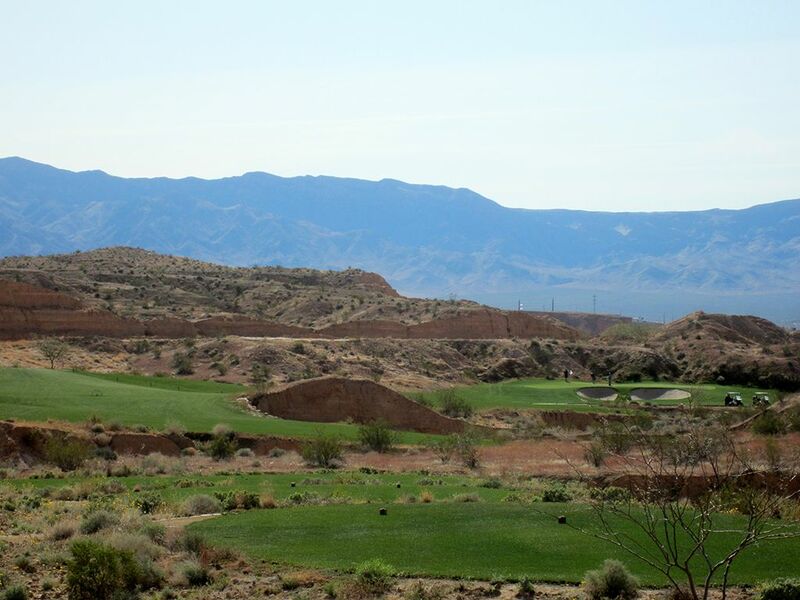 What to Expect: Conestoga is the newest offering to Nevada's desert canyon terrain found 80 miles north of Las Vegas in Mesquite, Nevada. 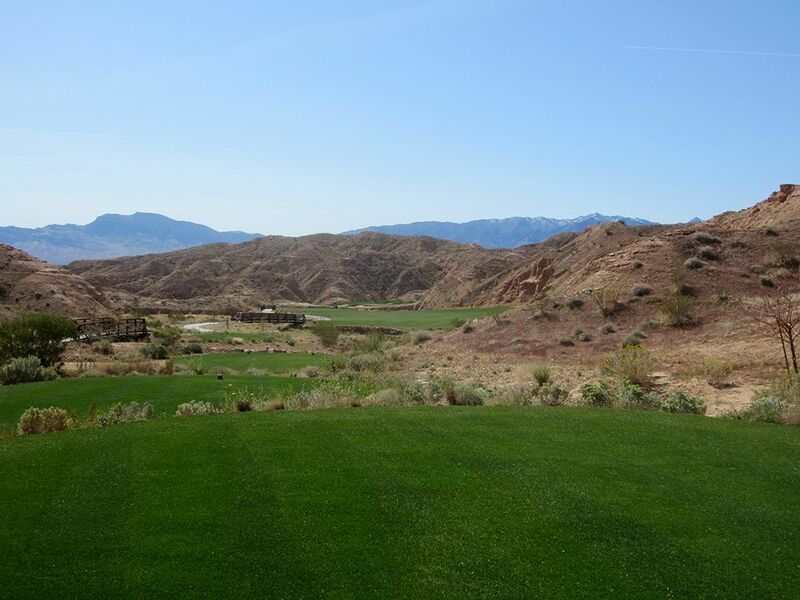 Designed by Gary Panks, the routing weaves through canyon landscape early in the round before wrapping around a pond at the turn and then playing along tamer terrain with some holes framed by current and future residential development. 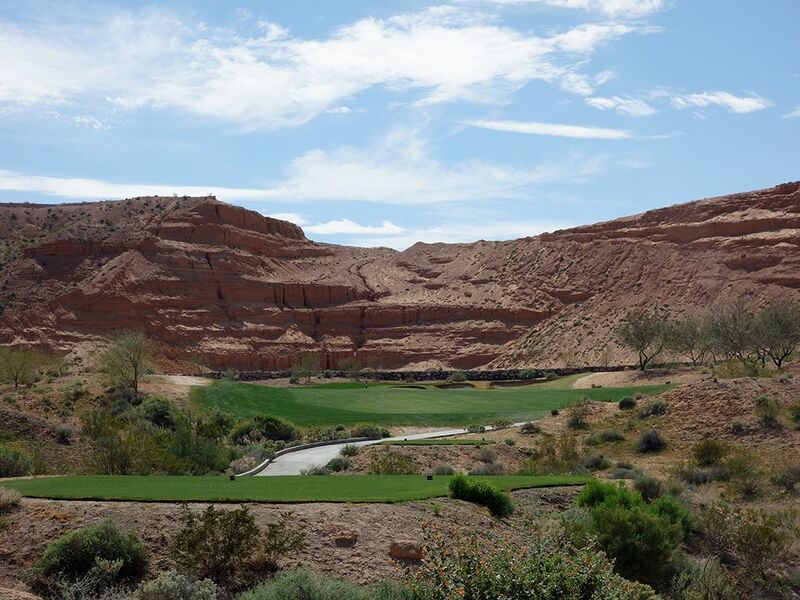 In general, the fairways are wide for a desert layout and instill confidence from the tee, although the semi-blind tee shot from the tips on #3 is one of the more intimidating shots I've faced in the desert. 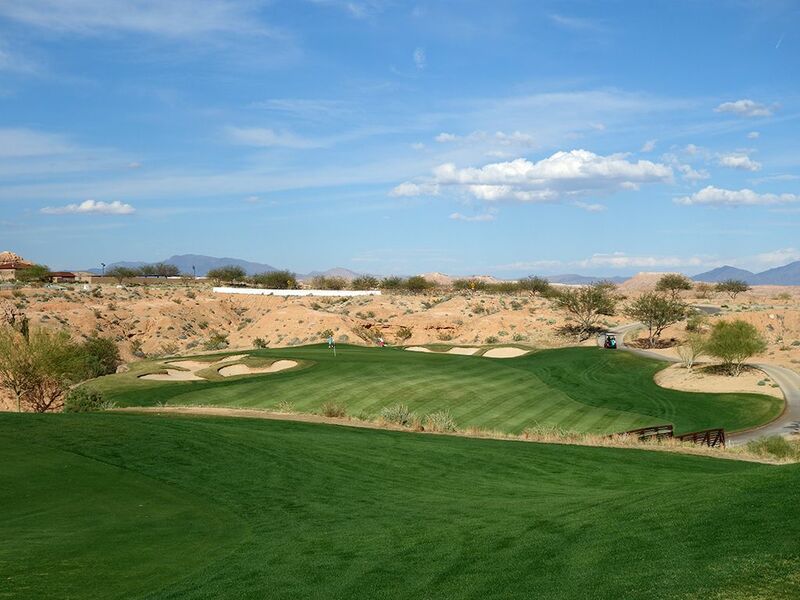 As to be expected at a modern desert layout, forced carries are required with the vast majority of tee shots in order to find the grass, yet the front tees are favorably setup to require less carry or are already found in the grass near the start of the fairway. 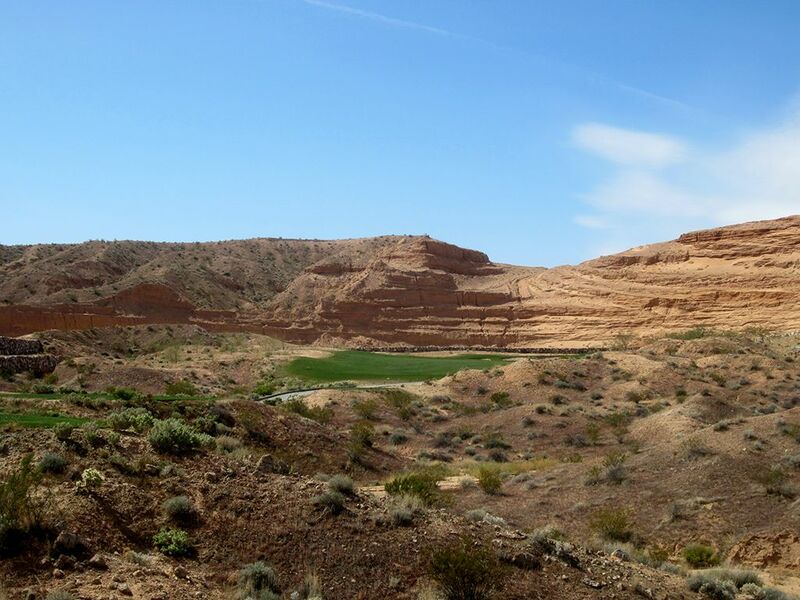 The par 3s are memorable with the front nine featuring one-shotters that play from elevated tees and the back nine boasting a 200 yard hole that plays over a pond plus a short one-shotter with a smallish green tucked into the barren hillside. As is generally the case at Troon managed facilities, the turf conditions are great though the green speeds can vary depending on the season. A multitude of bunkers are found throughout the course and are a factor to consider on the majority of full shots taken during the round. Conestoga is a great offering for the Mesquite area. 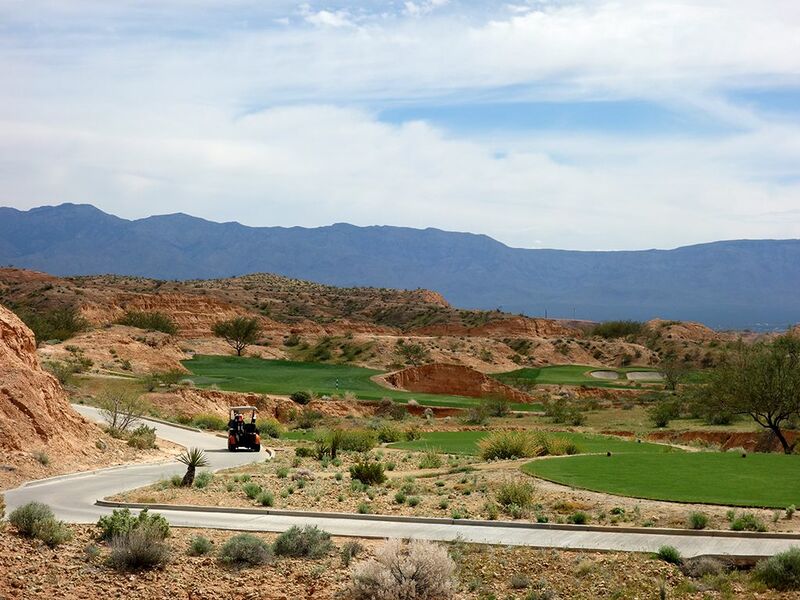 It doesn't have as extreme of terrain or views that Wolf Creek has but still delivers a flavor of desert canyon golf blended with some straight-forward traditional style holes. Signature Hole: 4th Hole – 394 Yard Par 4 – The most memorable hole at Conestoga is the unique 4th which is also known as "The Fence Hole." 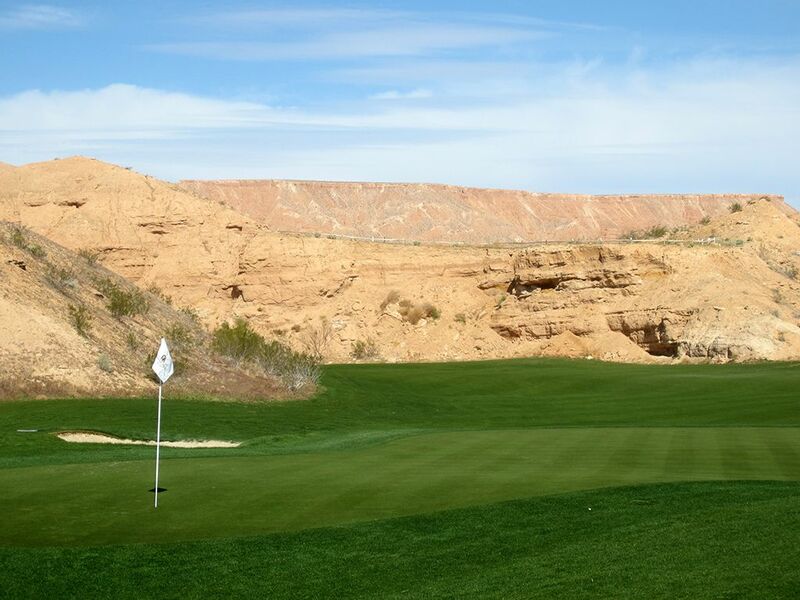 This par four features just under 250 yards of fairway before temporarily running out of grass and the golf hole falling 25 feet off a cliff where the fairway picks up again at the bottom. 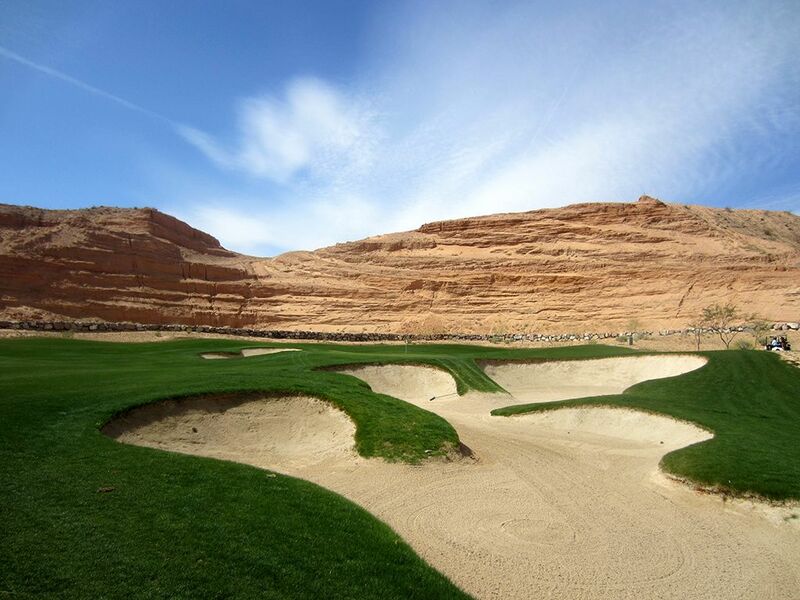 Players must decide whether they want to lay up off the tee and have a downhill approach to the green or whether they want to muscle their drive over the cliff and be left with just a wedge to the flag. Why is it called the fence hole? 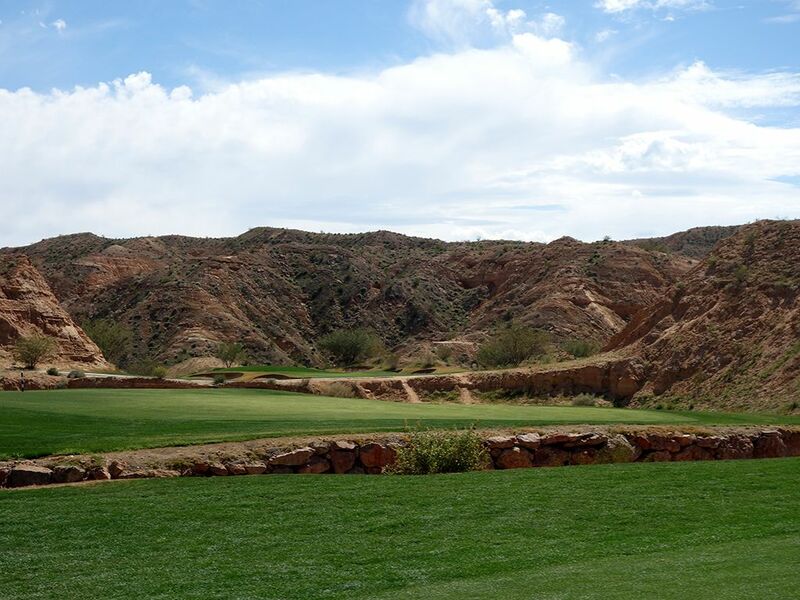 A wood fence reminiscent of the old west, the theme at Conestoga, marks the end of the elevated fairway and also acts as a protective barrier before the cliff fall off. The wise play is probably an iron or hybrid off the tee, but when have you ever started a good golf story with, "So I decided to lay up . . . "
Best Par 3: 2nd Hole – 188 Yards – The front nine at Conestoga is just flat out fun and the 2nd hole is part of the reason why. 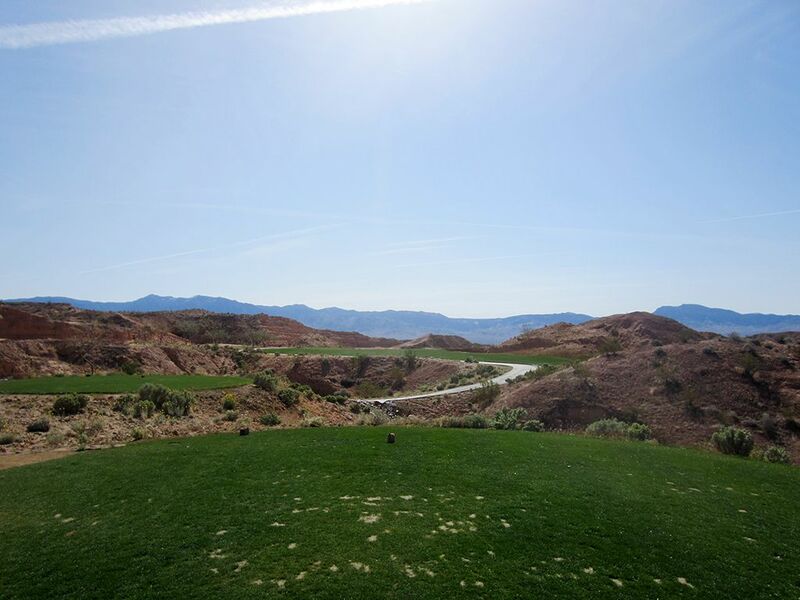 The elevated tee provides a commanding view of the surrounding property and the desert island target you are taking aim at. A rock retaining wall creates the border around the green and is a look is expect to see when the putting surface is surrounded by water. The large green is a generous target which is a welcoming design considering the elevation drop and when the wind is up. Ultimately, this is just a fun hole that quickly sets the tone for the course. Best Par 4: 17th Hole – 423 Yards – The front nine is clearly the more memorable and enjoyable side of Conestoga, but the 17th feels like a hole that belongs on the front nine. 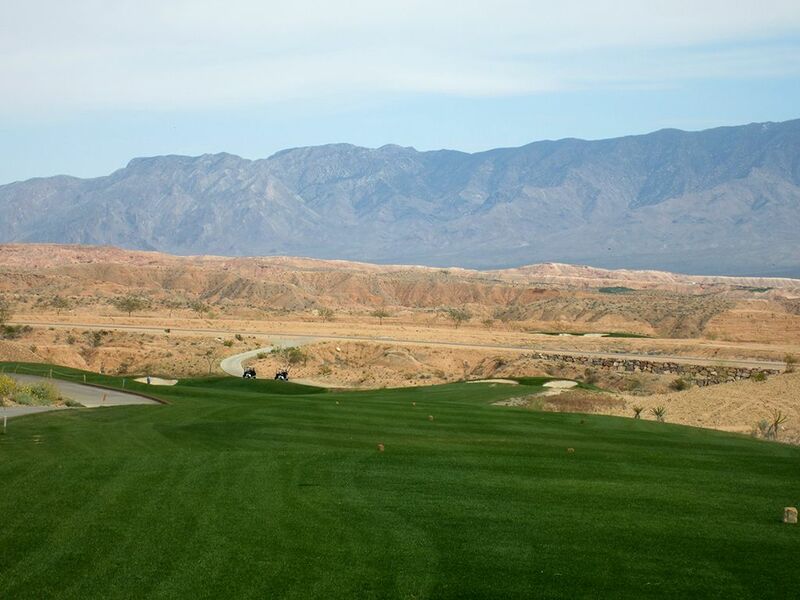 The tee shot plays downhill to a mostly blind landing area where you run out of room at 325 yards, which seems out of range for most people, but with the prevailing wind at your back and the downhill terrain in your favor you can run into the desert quicker than you may think. The hole takes a late turn left to the green protected by a bunker in the front and rear of the putting surface while tee shots up the left half of the fairway will have a blind approach to contend with. 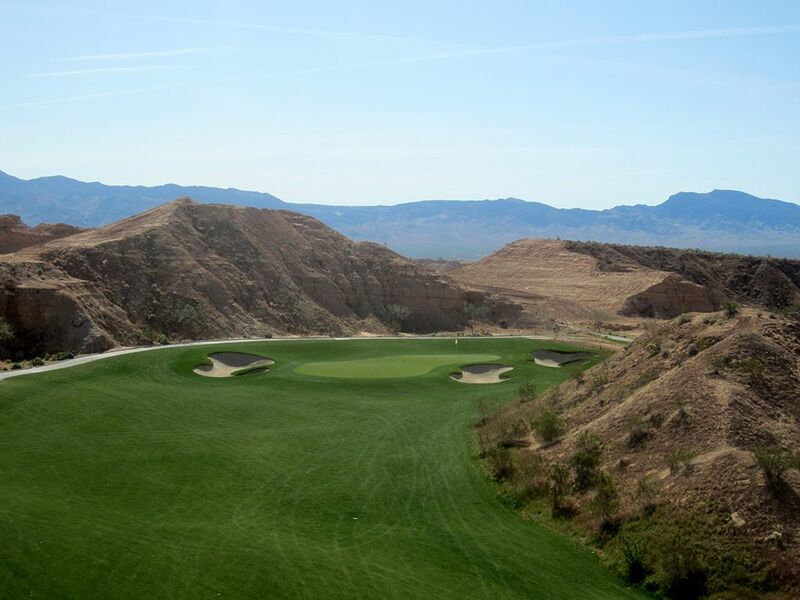 Best Par 5: 6th Hole – 536 Yards – The reachable 6th hole presents a unique challenge since there are three forced carries to contend with from tee to green. 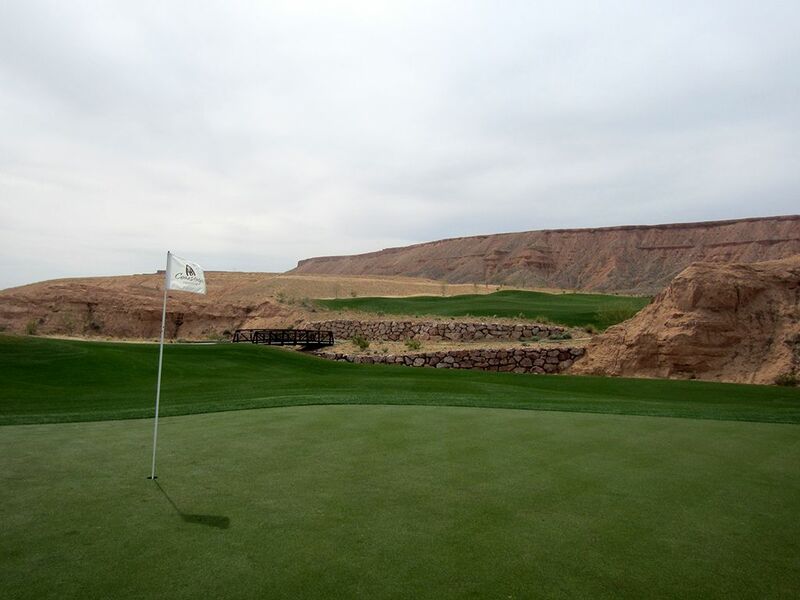 Players that can hit it near the far edge of the first fairway will be left with 225 yards to the green but players not wanting to contend with the big carry can play to a second fairway and leave themselves as little as 100 yards to the flag. 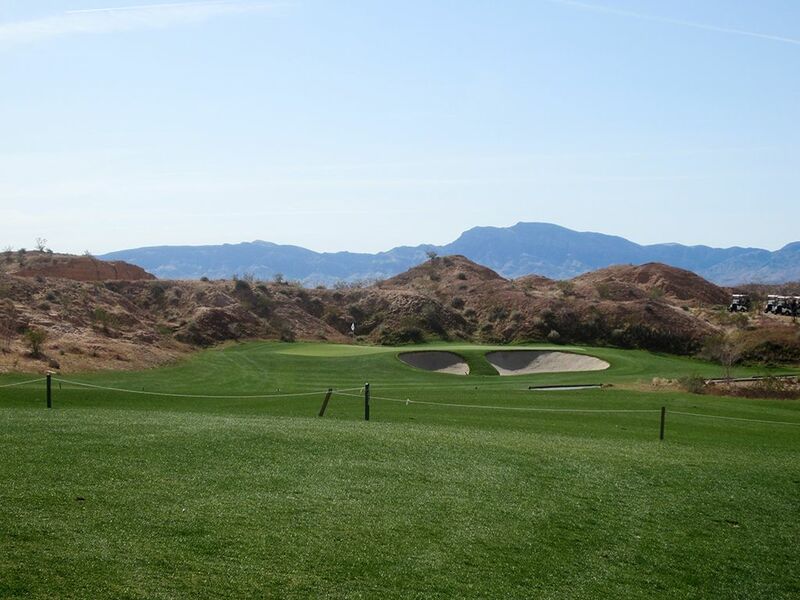 Players that can carry the ball well will love this hole while players who struggle to fly the ball will rarely score par as they trudge from one landing zone to another enroute to the green. Birdie Time: 7th Hole – 324 Yard Par 4 – The shortest par four at Conestoga is this driveable hole that begs for a power fade off the tee. The hole plays uphill so you may need a tail wind to help you reach the green, but hitting the putting surface with your tee ball is far from necessary to throw a birdie on your card. A tee shot up the left side will open up the angle to the green with a short wedge shot to the flag. With a short chip from the fairway, you have a great chance of hitting it close and taking a stroke back from Old Man Par. Bogey Beware: 3rd Hole – 418 Yard Par 4 – The length on the 3rd hole isn't intimidating, it is the visuals; particularly from the back tee. The fairway starts with a relatively welcoming opening but narrows quickly when the right half of the landing area disappears into a large stone. With the fairway sloping left to right and the entire right side of the fairway being a deep desert wash, nothing less than a precise drive up the left cut line will suffice to find a decent position for the approach shot. The approach shot plays uphill to a wide but shallow green fronted by a deep bunker. Missing this green in regulation leaves few appealing options for getting up and down. If there is one thing you have to do here it is swing your driver with confidence because a lackluster effort will be severely punished.